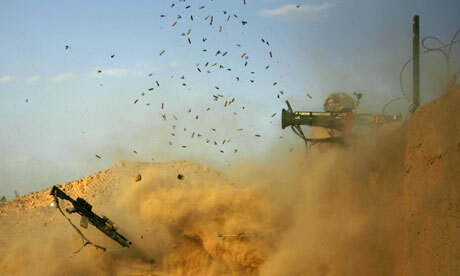 Obama's only way out of Afghanistan is to talk - Tariq Ali, The Guardian, 200112. Submitted by Jim_Roche1252 on Mon, 06/02/2012 - 10:55. This week Afghan guerrillas carried out yet another raid on the Kandahar airbase. General John Allen, the American commander of the Nato-led International Security Assistance Force (Isaf), issued an odd statement: "Mullah Omar has lost all control over Taliban insurgents, otherwise he would immediately denounce these attacks and order his 'forces' to stop attacking innocent Afghan civilians." The same Mullah Omar who has been on the most wanted list since 9/11? Remarkable only if one wasn't aware that the Omar faction of the Taliban has been conducting on-and-off negotiations with the US for several years. None have so far resulted in an agreement. The Kandahar attack may have been carried out by another faction, one that is hostile to the very idea of talking to the occupier, but it could just as easily be another shot across the bows of a tired empire, just to hurry things along. All the media-hyped advances in Afghanistan were illusory. Hence the need to negotiate with the insurgents and further isolate the Karzai regime. Different factions of the neo-Taliban have been preparing to take power for the last two years. Their assaults on security installations, intelligence outposts and helicopters carrying Nato intelligence top brass indicate the extent to which they have infiltrated Isaf's "loyal Afghan" networks. The form of guerrilla warfare, if not the ideology of its proponents, is not dissimilar to resistance movements in the Second World War and the Vietnamese, Chinese and Cuban experiences, codified by Giap, Mao and Che Guevara. Several months after his inauguration, Obama pushed through an arrogant escalation of the war, backed by the EU vassal states, but resisted by some of his own generals including Karl Eikenberry, the ambassador in Kabul. Obama's reasoning went thus: "If the Afghan government falls to the Taliban – or allows al-Qaida to go unchallenged – that country will again be a base for terrorists who want to kill as many of our people as they possibly can … For the Afghan people, a return to Taliban rule would condemn their country to brutal governance, international isolation, a paralysed economy, and the denial of basic human rights to the Afghan people – especially women and girls. The return in force of al-Qaida terrorists who would accompany the core Taliban leadership would cast Afghanistan under the shadow of perpetual violence." But many of these vices exist already (including the condition of women). More importantly, the reckless assaults on villages and "targeted" enemies upped the civilian casualty rate, providing easy recruits for the insurgents. Add to this the fact that those regional forces that had supported – reluctantly in the case of Pakistan's intelligence agency, the ISI – the toppling of Omar's regime are no longer on side. Iran has been alienated by the sanctions and US-EU hostility (itself the result of unremitting Israeli pressure); the Northern Alliance is a busted flush, its leaders busy making money like the Karzai family; and the Pakistani military never broke off contact with the Taliban. So, lithium reserves notwithstanding, it has become more and more difficult to sustain the Nato presence in the country. The 42 countries engaged in the occupation can no longer help the embarrassing marionette in Kabul to dance a good show. And a quick-fix election organised at high cost by western PR firms, essentially for the benefit of western public opinion, no longer does the trick. In essence both sides confront a stalemate. The insurgents cannot win militarily, but they have made a Nato victory impossible. The US could only win the "just war" by destroying the country and wiping out a million or two Afghans – but that is politically unfeasible. Negotiations are the only possible route to a settlement and US withdrawal from the country. What we are witnessing is the end of a disastrous occupation that achieved even less than the Russian version did during the 1980s. Within the United States, realist critics of imperial adventures have been warning of hubris for some time. John Mearsheimer, avoiding euphemisms of every sort, pointed out acutely in The Tragedy of Great Power Politics that the foreign policy of his country was devoted not to good governance or liberal values, let alone peace – but to the defence of US interests against those of other states. And it was this fact that would determine the politics of the 21st century. A version of this message from the maverick libertarian, Ron Paul, is currently being repeated on US television in its coverage of the Republican primaries. Paul is the only figure in national politics to demand the dismantling of the American empire. Interestingly, he wins more support from military families than all his rivals.